Cartier just launched L'Envol (the flight). If you read about the fragrance online, you'll see it compared to the scents of mead and ambrosia; there's even a connection with one of Louis Cartier's favorite people, aviator Alberto Santos-Dumont. Santos-Dumont has a Cartier watch and perfume named after him, and you may have seen "him" (wearing his Cartier watch) in the beautiful L'Odyssée de Cartier film (he's the guy in the sky bringing the leopard back to Paris). I got a kick out of L'Envol's sample card's wording, which shows even super-rich companies fall short in PR and translation: '"Un nectar aérien et boisé. Une potion de vie pour prendre son envol" was translated as "An airy and woody nectar. A life potion for men to take off. "1 After spraying on L'Envol, I didn't want to take it off; I wanted to spray on more. L'Envol was developed by perfumer Mathilde Laurent and its listed notes include honey, lignum vitae, iris, patchouli and musk. L'Envol starts off with an accord I'll describe as iris-violet flowers; the opening is refreshing, but also, somehow, soothing; next up is a slightly smoky, medicinal/bitter wood aroma (imagine quinine-drenched wood chips). On my skin, honey comes into focus in L'Envol's heart and base— it starts off diffuse but it slowly concentrates as it combines with rich patchouli (with a red-fruit aura) and an 'engaging' musk note. L'Envol's musk is clean but not your usual white musk; this is "dressy" musk, not animalic/beastly in character. On several wearings, I was sure I detected a smidgen of tobacco in L'Envol, and it did at times remind me of a softer/lighter version of Serge Lutens Fumerie Turque. L'Envol smells great (and a little bit retro). The perfume is not eccentric and it doesn't call attention to itself, but L'Envol isn't dull, either. L'Envol's tone is stylish (and expensive), not flamboyant. L'Envol has little sillage but if applied liberally will last most of the day. It was interesting to me that the women I let smell or wear L'Envol were almost unanimous in their delight with the scent. Men? They weren't as enthused. Perhaps most of the men I asked were too 'young' for L'Envol or they found its extreme dry down 'troublesome' (L'Envol develops into a scent that reminds me of deluxe face powder). I'm wondering how L'Envol will fare in the marketplace; I hope it's a success. L'Envol comes in a beautiful 100 ml refillable bottle with two parts: an open-bottomed "cloche" or dome, and the perfume-filled "ampule"/capsule that snaps in and out of the dome. The bottle design reminds me of a more complex Aeon 001 bottle. 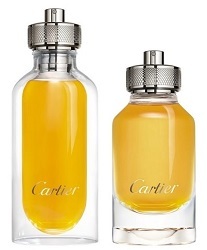 L'Envol de Cartier Eau de Parfum is available in 50 ml ($90) and 80 ml ($115) standard perfume bottles (no glass dome! ); the refillable 100 ml bottle is $132 (with its refill capsule priced at $92). 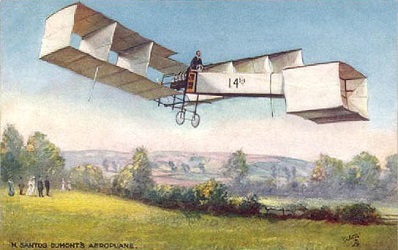 Note: top image of French postal card showing Santos Dumont flying the "14 bis" via Wikimedia Commons. Another one to pine after. Dusan, take off to a department store immediately! This is so alluring! The notes, your comments, the Santos Dumont reference, everything makes me want to smell it today – unfortunately, it’ll probably take a while to arrive here in Perfume Mordor. Thank’s for the review, Kevin. Solanace..ha! What part of the world do you live in? I’m a Brazilian, just like Santos Dumont. Solanace, I bet you’ll get it soon then. I think maybe their “take off” means to “take flight”….anyways….me want. Thanks for the review, Kevin! …and had I scrolled down further, I would’ve seen what you added! lol! Too quick on the trigger! I was dying to read a review of this as the notes sounded wonderful and Laurent has done some great stuff. Your review has made me want to try it even more. The slightly iffy translation notwithstanding. Hi Austenfan! The notes sound great indeed. Hi to you too! They do, and Mathilde Laurent is a great perfumer. Just watched the short film…Life of Pi in the Sky. That aeroplane is incredible. Glad to see this perfume doesn’t cost a fortune AND sounds fabulous. Thanks for reviewing it Kevin. Kanuka…the refill is a bargain. I’m on sort of a permanent moratorium on scents — I just don’t need any more, I have more than I could wear in a lifetime — but damned if this review didn’t make me fall instantly in love with this, without even smelling it. Honey? Smoky wood? Softer Fumerie Turque? I’m so in! I’ll be in Toronto in November: surely Holt Renfrew will be carrying it. Haven’t seen it in Montreal yet. You’ve inspired perfume lust again! I was already rapturous about getting to smell/buy this… now it’s a for sure Blind Buy! Absolument! NoseKnows: no matter what, you’ll have a great bottle. “I’ve tried this as they have arrived here in Bs.As. This is a well crafted, smoky, kind of throwback scent. The honey is definitely there. At one moment, when the fragrance is transitioning through its mid-stage development, it nearly derailed for me… with this I mean that some frags do not play well with my skin and if (this is my personal assesment, take with a grain of salt) the materials are cheapo, it all soon smells like soggy cardboard. Now this has skipped going off road though I can swear I smelled soggy carboard for one split second. If that is all, I can take it! Drydown is developing nicely with still a touch of honey and plenty of guaiac. Patch and musk, though present, play second fiddler to the other notes. Hi, kaos.geo! It’s good to see you and get your perspective, too. Hi nozknoz! I am always around.. just lurking a lot lately as I am focused on work and not posting much (nor buying perfume) but I tried this on the street the other day and liked it very much. kaos.geo: true, could be Jules’ skinny grandson! HA! Throw back to the 80s???? Now I MUST try this! Another must sample! Has this actually arrived in Seattle, or did a sample wing its way to you? Actually, I’m seeing it on the Nordstrom website. I’m going to be in Seattle next week and am considering a pilgrimage to Nordstrom No. 1, if I have any time for shopping, so perhaps I’ll get to sniff it there. Also, I’d forgotten how astonishing and beautiful that video is, and no less impressive four years on. Thanks for the link! Noz: you’re welcome…I watch that video every now and again! Yes, Nordstrom downtown Seattle has the fragrance in stock. I am lemming this and have a very good feeling that this will work out just like my other lemmings from you — Coromandel and L’Occitane Immortelle de Corse! hajusuuri: let me know if it’s three for three! Thanks for the info. I think I’ll stick with Santos.